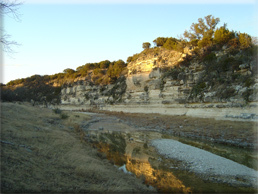 Gentry Creek Ranch is a 9,000 acre ranch located in the Hill Country of Texas. Operated as a working ranch in the Pfluger family for over 75 years, Gentry Creek is steeped in history of years gone by as well as beautiful terrain. With deep canyons, bluffs and the rambling Gentry Creek, hunters and guests return year after year to rejuvenate their souls. © 2008 Gentry Creek Ranch, Akaro Graphics. All Rights Reserved.